← MEGA Spring Meltdown – This Weekend! 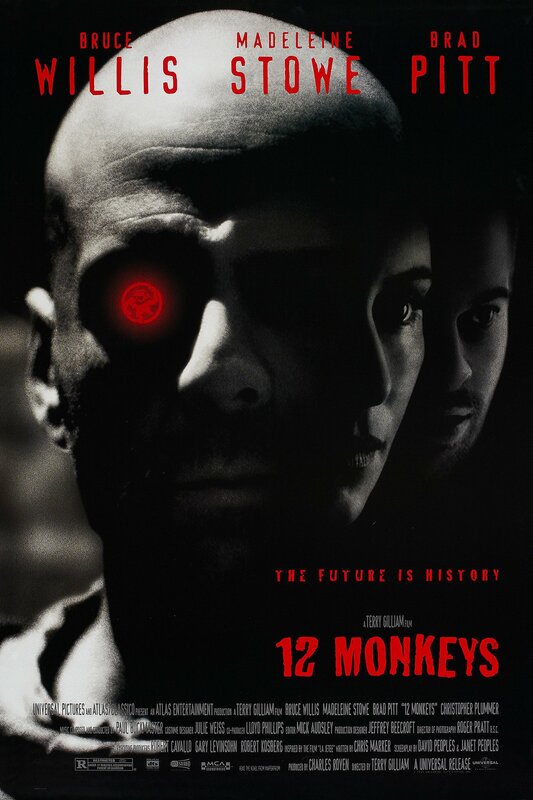 Main Street Landing will be screening Terry Gilliam’s classic science fiction film, 12 Monkeys on April 18th. La Jetee, the French film on which Twelve Monkeys is based, is a science fiction story, the most famous work (and the only fiction film) by famed documentarian Chris Marker. The story is told through a succession of still frames with voiceover narration, and in only one brief shot does this motion picture actually move. Gilliam claims in interviews that he has never seen La Jetee, but there seems to be a direct reference to its unusual style in a scene where Dr. Railly narrates a slide show about a delusional soldier in World War I. And when Railly and Cole take refuge in a movie theater that happens to be showing Alfred Hitchcock’s Vertigo (an important influence on Marker and La Jetee), we’re forced to consider suddenly, almost subconsciously, the many interesting ways that film is this film’s doppelganger. In the year 1997, some five billion people are wiped out by a deadly virus that renders the surface of the planet uninhabitable, driving the few survivors underground. Some 30 years hence, researchers living underneath Philadelphia have concluded that the virus may have been deliberately introduced by an underground organization calling itself the Army of the 12 Monkeys. Serving a life sentence, convict James Cole (Bruce Willis) is chosen to travel back in time to gather information about that organization in an attempt to pinpoint the origin of the virus, which remains incurable. Cole is forced to “volunteer” for this disorienting assignment mainly because he has an extraordinary memory. That memory has also wrapped itself around a traumatic vision from Cole’s childhood — of a man being gunned down at an airport — that manifests itself as a recurring dream. The film will be free (donations appreciated), and will screen at 7 pm at the Main Street Landing Film House in Burlington.